Now that you've all become accustomed to checking in via the web everywhere you go, it's time to introduce you to the latest craze to hit the mobile internet in China, namely "Jiepang". (The Chinese "街旁" means "beside the street"). On Wednesday 24th November, I'll be interviewing David Liu, Co-Founder of Jiepang, China's latest location-based social network (think FourSquare with Chinese characteristics). David cut his entrepreneurial teeth in Taiwan with "Wozai". After studying at UCLA, David worked on several start-ups in social networking, desktop software, and mobile software. David grew up in Silicon Valley and today lives in both Beijing and Shanghai. 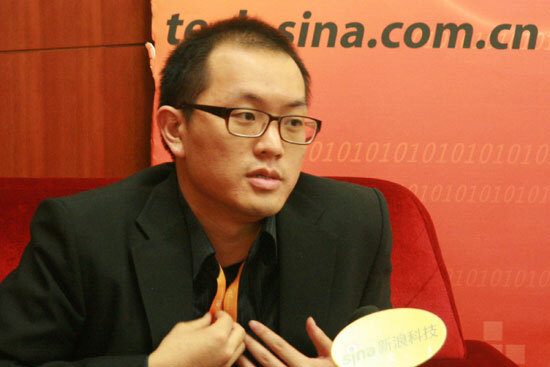 (Recent photo of David below taken at Sina Weibo's 1st Developer Conference in Beijing). Let us know that you're coming by signing up on Facebook or our contact form on this blog. CNN recently interviewed David as shown on this video hosted by Tudou (ironic, inst it? The event will kick off at 6:30pm and wind up around 9:30pm, with the interview starting at 7:15pm. As per usual, there's a HK$100 entrance fee, including one complimentary drink and the chance to win lucky draw prizes. Jiepang is also generously sponsoring up to 100 drinks if you use Jiepang to check into the venue at the event. 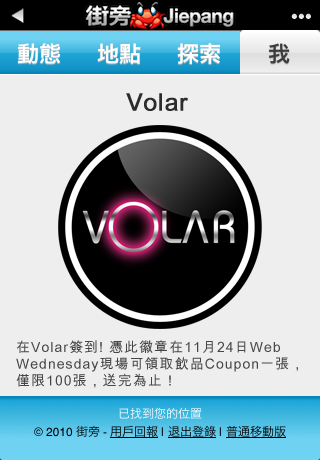 Venue is the still-stylish Volar Bar & Club , Basement, 38-44 D'Aguilar Street, Lan Kwai Fong, Central, Hong Kong. 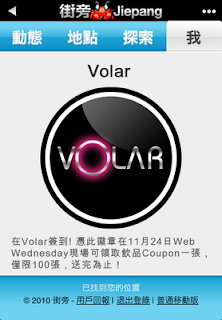 The steps are simple: (1) Register for Jiepang (via jiepang.com), (2a) Download the App (iPhone or Android) or (2b) Mobile surf to m.jiepang.com, (3) Check into Volar, (4) Show your badge (sample below) to the Jiepang staff who will issue a coupon, (6) Show coupon to bar tender, (7) Bob's your uncle! (Wonder how many of you will try to outwit the system by just showing the above jpeg?). Here's an introductory video explaining how Jiepang works and why you'd want to join. As per usual, there's a HK$100 entrance fee, including one complimentary drink and the chance to win lucky draw prizes, sponsored by Spoilt.com.hk. You can connect with Jiepang across several social media channels: their blog (we.jiepang.com), Twitter (@jiepangtw), Facebook (jiepanghk), Plurk (does anyone still use this? ), Sina Weibo (t.sina.com.cn/jiepang), Douban and in person at Web Wednesday V42.0 on 24th November 2010!